The chief of Horsham Police has spoken out this week to reassure the community after a series of violent incidents involving young people in Horsham. District commander Miles Ockwell revealed that youngsters in the town are arming themselves with knives after getting caught up in drug dealing and violence, spearheaded by London gangs. 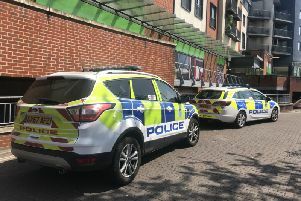 However, he said police were taking immediate action to combat the problem and Horsham still remained the safest place to live in West Sussex. Residents have watched with horror over the past couple of weeks following an outbreak of violent incidents involving young people in the town. Last Tuesday (March 19) two people were injured after a group of youngsters started fighting in Sainsbury’s car park. Later that evening a teenager was attacked in a ‘shocking’ incident outside a shop in Broadbridge Heath. A few weeks previously a mass brawl broke out between a group of around 15 youths in the Causeway and all three incidents prompted huge concerns amongst residents. Mr Ockwell said the increase in youth violence had been caused by a small cluster of youngsters which officers believed were involved in county lines drug dealing from London. He said: “They are local young people who have become involved, probably, on the fringes of county lines and some of them do choose to carry knives. “It’s a more recent phenomenon that we have young people on the edge of this county lines that are choosing to carry knives as that’s what feel they need to do. Mr Ockwell said that in the wake of the Sainsbury’s incident, police patrols were increased. During those patrols, five arrests were made and a knife, a knuckleduster, drugs, stolen property and £10,000 in cash were confiscated, Mr Ockwell said. He added that all were believed to be related to county lines drug dealing. Over the weekend a dispersal order was also issued to continue the crackdown on anti-social behaviour in the town centre. The force will be working with Horsham District Council, youth agencies and schools to try and tackle the issue and stop youngsters in the town becoming involved in drugs and violence. However, Mr Ockwell has also called on parents to help and talk to their children about knife crime and the dangers of carrying weapons. Mr Ockwell said violent offences including attacks and assaults had increased over the past year across the district by two per cent. Anyone with any information on on knife crime and drug dealing in the district is asked to contact police.